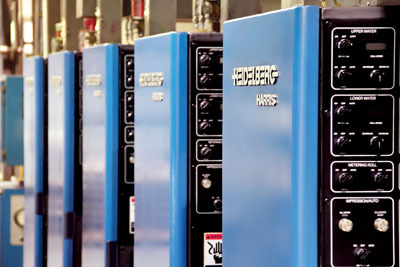 Web Offset’s presses are equipped with the newest computer controlled devices offered today. Our color control systems are designed to scan the sheet as it runs and make any corrections necessary in order to give our customers the most consistent color possible from the first copy to the last. Our registration systems on our presses are also computer controlled, which virtually eliminates blurry photos or miss aligned type. We can run standards, tabloids, magazines, books, calendars, digests or coupon books. We can run thousands of press configurations to meet any needs of our customers. As a publisher you want to offer to your advertisers the best product available, so why not print with the best.